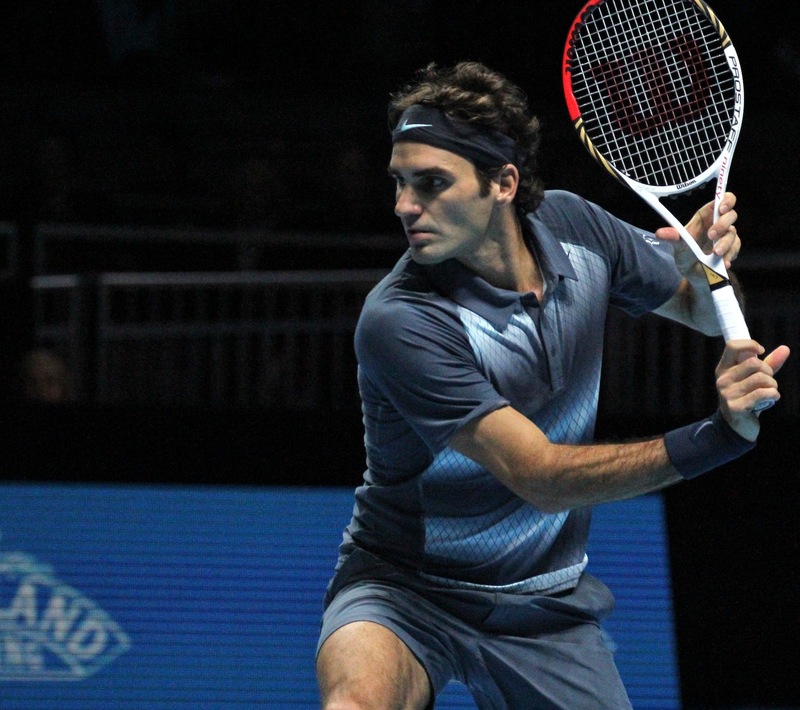 Yet again, the O2 in London proved to be a near perfect setting for the climax of the men’s tennis tour at the end of 2013. There is no denying the spectacle of its location on the banks of the Thames, with the Emirates cable-car sweeping more than 100 metres above it and a fleet of Clipper ferries laying on their own sight-seeing tour from the London Eye, via St Pauls, Tower Bridge and Canary Wharf to Greenwich. Under the white dome is a small town that, during this tennis jamboree, sees the biggest stars practising in front of anyone with the price of tube fare. But it is at the heart of the coolest venue in London that the real action takes place, on a blue rectangle that takes 42 hours to lay. And not a shot nor an expression is missed by the 18,000 spectators in a light-show that boasts some of the best slo-mo replays anywhere on the tennis circuit. Yes, both outside and inside, this is a spectacle, and the message has spread beyond fans of tennis to enthusiastic audiences from every walk of life, of every age and every nationality. Little wonder that, in its fifth visit to the O2, the World Tour Finals again broke new ground with more than a quarter of million buying tickets and as many again visiting the Fan Zone, practice courts, restaurants and bars during its eight days. Yet in the face of such popularity, the latter pair, this year’s finalists, remained keen that the event be held in other venues, though for rather different reasons. For Nadal, it is simple: Indoor hard courts have never yielded great success, his only title coming when his home Masters event in Madrid was part of the autumn indoor swing. I feel that I am unlucky. Since 2005, all the [WTFs] were indoors and that was not the best for me. Probably I was a little bit unlucky in this. I cannot find a better place to play than here, but that doesn’t mean ATP cannot be a bit more fair with all the players… we qualify for the Masters in all sorts of places. I think this tournament should be organised at different places more often, and not be held in one city for more than three years. This is the tournament that isn’t fixed for one city and one country. It’s in the ATP’s hands to think about …the promotion of tennis, having it in places where maybe tennis isn’t as popular and if we are looking to expand, then we should look at allowing other cities to compete for holding this tournament. I really enjoy that you step up on the court and you have nearly 20,000 people there… I don’t think there is any other competitor of the cities that can provide that… [It’s] the season finale for us, and I think it should be with really one of the best crowds I ever played. And that will always be in London’s favour: Essentially, where else could deliver the same audience, generate the same atmosphere or, most important of all, offer a practical alternative for the eight players? After the US Open Series, the ATP season swings to the important Asia constituency that culminates in the Shanghai Masters on outdoor hard courts. The season then moves to Europe for its last phase, the indoor swing that culminates in the Paris Masters. This year, the calendar does add a week between Paris and London to give space for recovery and adjustment to court surface, but long-haul time-zone changes in this exhausting final fortnight of the tennis year would remain hugely undesirable. And there are certainly few destinations within striking distance of Paris, in November, that would offer an outdoor option. Even if there was a venue within an acceptable time-zone, with the same facilities and the same potential audience—and one able to lay four clay courts between other entertainment events—how popular would a switch to clay be with the players after a month on indoor hard courts? Any alternative surface transition would seem to involve a dramatic rejigging of the ATP calendar—something as drastic as switching the Europe and Asia swings after the US Open. However, aside from such logistical problems, what of Nadal’s case for a fairer solution? Here is where the voice of Roger Federer speaks up loud and clear. It comes as no surprise that he likes the London event very much: As Nadal is to clay, Federer is to the indoors. He has won the year-end tournament six times and only ever fallen short of the semis once in 12 consecutive years—though he won in Houston and Shanghai as well as London. He has, indeed, won 20 titles indoors compared with 10 on clay, an achievement all the more striking because there are only 16 indoor tournaments in the calendar, just one of them at Masters level and with the WTFs the only one approaching Grand Slam status. Clay, though, has 22 tournaments, three of them at Masters level and, of course, its own Grand Slam at Roland Garros. I can understand where [Nadal’s] coming from, you know. Keep it exciting, different, whatever you want to call it. I must also make the point we have lost another Masters 1000 on indoors [the Madrid Masters used to precede Paris in October, but was switched to May and to clay in 2009]. Now we’re playing Shanghai outdoors [conceived as the replacement in the calendar for Madrid]—though I know it’s got a roof so it could be considered indoors at times because we have some rain there. But I truly believe the World Tour Finals should stay indoors, and I think indoors deserves a great event. Also what’s good about indoors, you know what you’re getting into. Matches are going to be played, not delayed… That’s why probably it has to stay indoor hard in my personal opinion. Perhaps, in fact, there is rather more fairness in keeping the WTFs on indoor hard courts than Nadal would choose to admit. For while he has been unable to win the only big title missing from his resume, Federer has also been able to win only a single French Open title, the one in which he didn’t face Nadal. He lost to his rival in four other Roland Garros finals, as he has also done in seven clay Masters—but they have never been able to contest an indoor Masters title. In this swings and roundabouts debate, the arguments have focused on the contrasting strengths—and opportunities—of the two super-stars of their generation, but tennis’s up-and-coming players should also expect chances to shine in every environment that tennis has to offer, whatever their strengths. Losing one more indoor event—and one of only two, arguably, at the elite level—would diminish a distinctive and rich vein in tennis. So until another major city worthy of the event’s special status is found—though it’s worth noting that Istanbul has now been vacated by the WTA Championships—let the World Tour Finals enjoy London, and let London enjoy the spectacle.